Re: Paranormal vs Flesh and Blood - an occultist's perspective. Ive listened a few times and did hear it . Not sure if it was because i was expecting it though! Do you ever get messages from spirits without using the ghost box? Wow I dont know what they were saying but that is really freaky and scary! The physical Yowie versus the paranormal Yowie? Just how smart is the physical Yowie? because without it's paranormal ability the intelligence of this creature is highly debatable. Let's take a look at what is presumed of his physical attributes. 2. Uses sticks displayed on the ground also a form of communication. Do all these actions equate to the physical Yowie? doubtful because Yowies have never been observed fulfilling any of the above except for number 6. If this is the physical Yowie then I would have to place him way below Homo-Erectus as this early form of mankind harnessed the use of fire as a warming agent and for cooking food 1.7 to 0.2 million years ago. Not very intelligent after all is the Yowie. 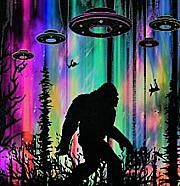 Now let's look at the paranormal Yowie or Bigfoot. 1. Has the ability to appear and disappear in front of our eyes. Able to be 10 foot away and no visual eye contact. 2. Able to move at speeds humans cannot comprehend. 3. The ability to levitate. 10. Appears to have bioluminescent abilities,tapetum lucidum although humans and great apes do not have this quality. Cannot anybody see a huge disparity from what we imagine to be the physical Yowie and the supernatural. It goes from being a fundamental backward creature to one of unbelievable intelligence. In my opinion the mystical Yowie is the dominant one but able to project himself in physical form if desired but I also believe the physical Yowie has yet to be proven until such time a body is produced.